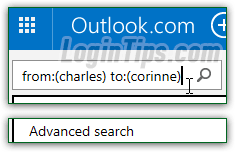 Hotmail, and now Outlook.com, comes with quite a few search tools to locate messages across your folders - some, already discussed in previous tutorial. In this tutorial, we'll show you how to make the most of the search box and advanced Find tool that comes built right in! The advanced search tool is especially powerful, and deserves a few minutes to get familiar with - once you know how to use it, you'll probably never give up looking for a message - you'll either find it, pretty quickly, or know that it was deleted from your account. If you categorized the message you're looking for, or if it's still unread, you can find it by category or filter - often much quicker! If you flagged that email, you can quickly find it by showing flagged messages only (see linked tutorial). 1 Click inside the "Search email" text box (or hit "/" to go to it). 2 For a basic search, type your search term(s) and hit Enter. 3 Use the dropdowns at the top of the results to narrow things down. 4 For more power, click on "Advanced search" at the bottom. 5 Enter one or more criteria, and hit Enter. Login to your Hotmail account and go to any email folder: then, click inside the "Search email" text box in the top right corner of the page. Tip: as long as you're not inside a text editable field, you can hit the forward slash key (/) on your keyboard, and the blinking insertion point will focus into the search box. Note: by default, Hotmail searches across your entire account (the content of all email folders). The advanced find tool discussed later in this tutorial lets you narrow down your search by folder. Notice also that the menu, or pane, that appears as you type, also includes a couple of handy shortcuts: click on "[your keyword] and has an attachment" to find emails that contain your keyword AND also include a file attachment. Or click on "Subject contains [your keyword]" to search for messages by their subject line (title). Within moments (the duration depends on the number of messages you have and how "busy" Outlook.com is at the time), you'll get a list of messages that Hotmail found matching your search term; notice from your search results, and the screenshot below, that the tool picked up emails regardless of the folder in which they are stored. What you're looking at is a "virtual folder" (screenshot on the left) - just a temporary location to show your cross-folder search results. Tip - a couple of oddities about Outlook.com: if you launch a basic search from the inbox, it will search the inbox and all your other folders (except spam). If you search from any other folder, it will search for messages inside that folder only; in the Junk folder, search is disabled (grayed out). Before you start an advanced search, notice that above your current search results, Outlook.com is displaying additional criteria by which you can narrow down your current search: only show messages from a certain folder, a particular category, those that contain attachments (or don't), or by date: Tip: to exit out of the search results' virtual folder, just click on your inbox (or any other folder). To find messages by a particular field, click inside the search box, and immediately click on "Advanced search" at the bottom of the menu / pane that automatically appears. "From" - enter a (partial) name or an email address inside that field to search by sender; the equivalent operator, which can be entered into the search box directly, is "from:". Tip: there's another way to find messages by sender - see last section. To find messages by title ("subject line"), type one or more keywords inside the "Subject contains" and hit Enter. The corresponding operator is "subject:". To include or exclude messages with attachments, click on that dropdown and make your choice; this only covers files actually attached to the email: "inline images" (common in newsletters, for example) are generally referenced from an online address - they're not part of the message!